What do the great prophetsAmos, Hosea, Isaiah, Micah, Ezekiel and Jesus—have in common with us? asks Joan Chittister. And she answers: All of them were simple souls like you and me. All of them loved without limit, burned with an enduring patience, were afire with God and proclaimed a new vision. All of them invite you and me to claim our prophetic dimension and speak God’s work in the midst of human chaos. 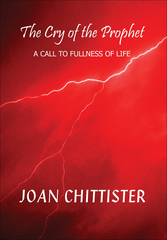 Prophecy, she insists is not a luxury; it is an essential dimension of the Christian life. BOOK INCLUDES: • A chapter on each of the major prophets • Scripture reflections • Echoes: Voices of Women Prophets • Photo and Poetry meditations • Personal and group discussions, questions and activities.